Back to the classroom! 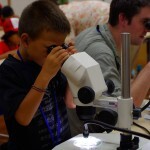 After transferring their specimens in a petri dish, students looked at the arthropods with a dissecting scope. Despite being the first time of using such a tool for most of them, they quickly learned to use it efficiently and to share their samples. In the meantime, other groups were experiencing the pheromonal communication in termites. Using pens, which inks contains similar molecular compounds than those used in termites trail-marking, kids draw their names, figures or some kind of labyrinths for disoriented termites. Quickly the shiro-ari (termite in Japanese) followed the fresh trails for the happiness of the children. I then explained that nothing was magic, but that insects live in a world of odors where for us it is mostly a world of sounds, colors and shapes. 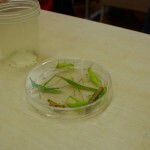 After the class, all the kids loved insects! Even a young boy too shy to claim it in front of the class, came to tell me at the end that he would like to keep some insects at home. 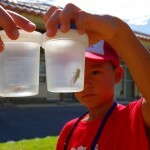 Thanks to our 2-days of teaching, 27 entomophiles got released in the wild. Insects, watch out! Who knows? Maybe in a few years we will cross path again in professional meetings. You can read more about this event on the OIST website.